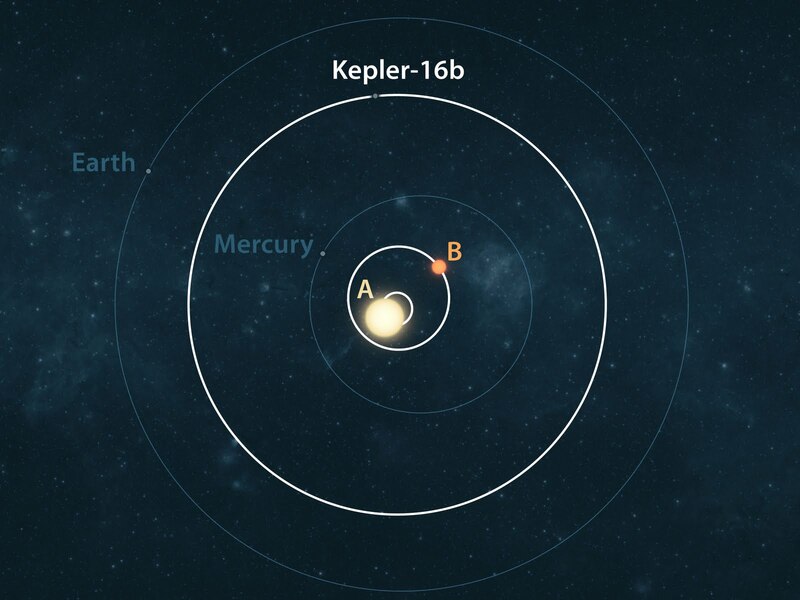 Stellar Planet: Is Kepler 16b George Lucus’ Tatooine? NASA’s Kepler Mission team announced today that they have detected the signature of a planet orbiting a binary star system. Was George Lucas’ alien image of a double sunset on Tatooine in Star Wars IV genuine scientific foresight or just a matter of cinematic depiction? The binary system is 200 lightyears away in the direction of Cygnus (the region where the Kepler planetary search is focused). Binary stars are common in our galaxy, as well as many others, and the term merely describes two stars that orbit each other. In this case the two stars are orbiting each other in a period of 41 days and at a distance within that of Mercury’s orbit around the Sun. Unlike the stars depicted from Tatooine the two stars in the binary system are very different to each other and both are smaller and dimmer than the sun. The larger star is 69% the mass of the Sun; glowing a deep orange and is 100 times brighter than its dim red companion star which has a mass just 20% of the Suns. The Kepler lightcurve also shows that the stars are active; this means that we can observe large starspots on their ‘surface’ (starspots are cooler regions of the stellar atmosphere and appear as black dots on our own sun). The planet is in a wide orbit around both of these stars with a period of 229 days and a nearly circular orbit. This orbit means that it feels the gravitational pull of the two stars as one single point. The planet is a cold, gaseous world similar to Saturn and is not thought to harbour life. The dynamics of the system, or any binary system, means that the area (like the one we live in) around a star known as the goldilocks zone or the habitable zone is a dynamic one. The temperature change due to the two stars orbiting each other would have an effect on the planetary temperature as well as the change in light due to an eclipsing binary system and the differences in the stars themselves would mean that the light from the two ‘Suns’ would have different effects on the planet and the seasons as we know them would not exist. So, unfortunately there is not much chance of standing on the surface of the planet gazing like Luke Skywalker out at the double sunset while being serenaded by John Williams. This system may not be the Tatooine that George Lucus dreamed up but it is a huge step forward in the hunt for habitable exoplanets as most of the stars we look at up in the sky are in fact binary systems. And if we can find one planet orbiting two stars that is dynamically stable you can bet that we are going to go out and look for some more. 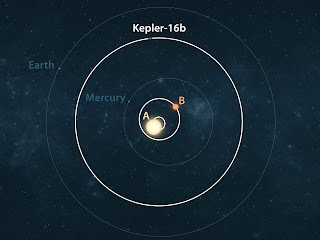 If you want to go looking for Kepler 16b you can find the star system with a magnitude of 11.5 in the right wing of the Cygnus constallation.